The following chapter of the People who Shaped Toronto series features Edward James Lennox, one of Canada’s most distinguished protagonists of Richardsonian Romanesque architecture. Lennox was responsible for the designs of more than 70 buildings in the City of Toronto, many of which are important urban landmarks. His works were designed in various styles, including Richardson Romanesque, Neo-Classical, Gothic Revival, and Beaux Arts. Lennox played an eminent role in Toronto’s architectural community and significantly influenced the shape of Toronto between 1876 and 1915, when the city experienced a huge boom. Marilyn M. Litvak writes in his book, Edward James Lennox: “Builder of Toronto“, about Lennox’s exceptional ability to combine classical features with with modern trends. Born and educated in Toronto, Lennox looked to the past for inspiration but was never captured by it. His prototypical Annex houses on Madison Avenue, Old City Hall, and Casa Loma bear witness to his technical expertise and aesthetic sensibilities. 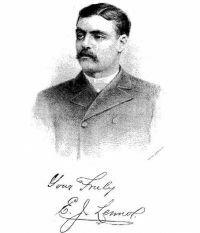 Edward James Lennox was born September 12, 1854 in Toronto to a family of Irish immigrants. His father emigrated from Belfast, Northern Ireland to Upper Canada in 1832. By the time E.J. Lennox was born, he and his wife ran a grocery store on College Street, where they also lived. In those years, Toronto was a small city with a population just over 30,000, a third of which were Irish immigrants. Lennox witnessed all of Toronto’s major changes during its rapid growth in the late 19th century. At the age of seventeen, Lennox started to study architectural drawing at the Mechanics’ Institute in Toronto. Even though most of his classmates were about ten years older than he, Lennox graduated as the best student of his class. His talent and interest for architectural drawings earned him a great reputation, and just after finishing school, in 1871, he started to work as an apprentice with Toronto architect William Irving. Young Lennox was significantly influenced by the experienced Irving, who very often used sculptural style. After five years, Lennox ended his contract with Irving and formed a partnership with his colleague William McCaw. Their agenda included spacey mansions, large, neo-Gothic churches, and a top-notch hotel that was constructed for the world-famous Canadian rower Ned Hanlan and located on Toronto Island (demolished). The partnership with McCaw lasted until 1881 when Lennox decided to start his own business. The same year, he married Emiline Wilson, with whom he had four children. He didn’t have to wait for long and soon became one of the most successful architects in Toronto. In the beginning of the 1880s, Lennox was working mainly on smaller projects, but his reputation was growing, and in 1886, he won a contract for Toronto City Hall (1877-1899). Before starting to work on the Old City Hall, Lennox visited many major cities on the eastern coast of North America and studied their city halls and other important government buildings. 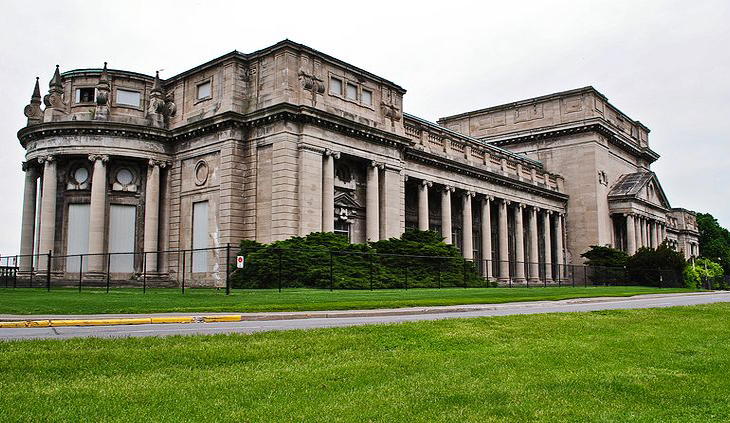 In those years, the most prevailing modern American architectural style was Richardson Romanesque, founded by Henry Hobson Richardson from Boston. Lennox did not directly mention the name of H.H. Richardson or his Allegheny County Courthouse in Pittsburgh, but indicated that the only building with similar features as Lennox’s Old City Hall was in Pittsburgh. 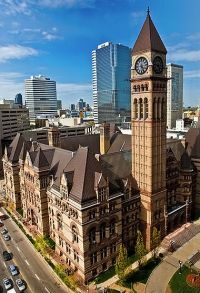 Old City Hall was a beautiful mixture of Romanesque Revival with Italian, Spanish, and French Romanesque elements. The typical features of Romanesque Revival were roman styled brick with terracotta, hipped roofs with multi-gabled dormers, strong and sturdy masonry walls as well as broad and curved door arches. The construction of Old City Hall cost more than $2.5 million, and it took about twelve years to build it due to several legal disputes that arose during the building process. This important heritage building located at the corner of Queen and Bay Streets was the largest civic building in North America upon its completion in 1899. At the front elevation is placed a distinctive clock tower that provides a terminating vista for Bay Street. Lennox left several signs around the entire building with the words “EJ LENNOX ARCHITECT AD 1898.” Furthermore, there’s a caricature of E.J. Lennox with a handlebar moustache on the façade of the building. By the early 1900s, Lennox gained attention of some of the most important Torontonians like George Gooderham and Sir Henry Pellatt. He was well known for his panache and impressive self-promotion in the press. He was an unfailing source of brilliant architectural ideas. For Gooderham, he did a great job adjusting and enhancing the design of the King Edward Hotel (1900-1902), which was originally made by a noticeable Chicago architect, Henry Ives Cobb. The hotel, located on the south side of King Street East, is still operating as a part of the Le Méridien chain of hotels. His first job for Pellatt was the neo-renaissance Toronto Power Generating Station (1904-1912) located along the Niagara River in Niagara Falls. The plant operated until February 15, 1974 when Ontario Hydro decided to supply the town with hydro-electric power from the Sir Adam Beck Hydroelectric Power Stations in Queenston instead. In 1983, the powerhouse was designated a National Historic Site of Canada. Pellatt was more than satisfied with Lennox’s design of the Power Generating Station, so he entrusted him with the construction of his mansion, which he wanted to be the “grandest home Toronto would ever witness.” Lennox worked on this towered grand house also known as Casa Loma from 1909 to 1913. Lennox combined two architectural styles: Gothic Revival and Richardson Romanesque. Casa Loma is a complex of buildings that includes massive stables, a potting shed, a hunting lodge, and the main castle building. As soon as the stable complex with the hunting lodge was finished, Pellatt sold his summer house in Scarborough and moved to the hunting lodge while the main building was still under construction. 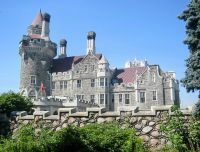 The building cost approximately $3.5 million, and with 98 rooms, Casa Loma was the largest private residence in Canada. 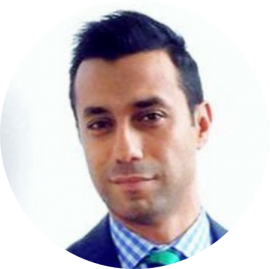 Unfortunately, not even a decade after moving in, Pellat was forced to sell his beloved home due to severe financial setbacks. Casa Loma was the most luxurious residence in Toronto, boasting the most modern technologies available. For example, it was the first residence in Toronto that had an elevator. More than forty domestic and ground workers were hired to maintain the mansion in top condition. 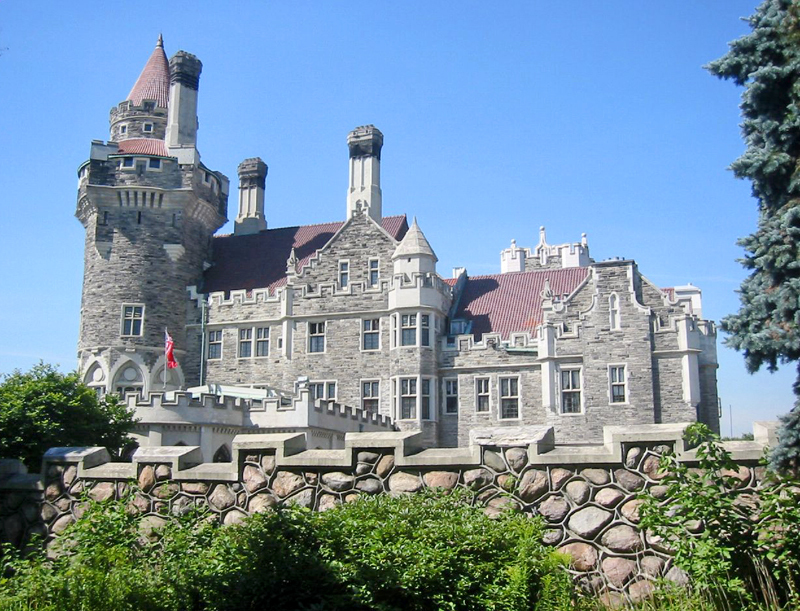 Today, Casa Loma is a well known tourist attraction and important landmark. The mansion is maintained by the Kiwanis Club, which also organizes various activities and events and from the money raised supports a number of charities in Toronto. If you want to find more information about current events in Casa Loma, visit their website. After finishing his major projects, Lennox decided to build his own dream house. He was already in his 50s, and his mansion was one of the last works he produced. His 21-room residence was built on three acres of land in the shadows of Casa Loma where he enjoyed his retirement after giving up his practice in 1917. During his long career, Lennox designed about 70 buildings in the city of Toronto. He was one of the most influential architects of his era and played a major role in development of Toronto. Even after retiring, Lennox maintained his prominent position among Toronto architects. He made use of his knowledge and experience as a member of the Toronto Transit Commission from 1923 to 1929. In 1931, when he was 77 and Ontario passed legislation requiring every architect to pass certification exams, Lennox took the exam and passed. However, he didn’t design another building. He died in 1933 at the age of 79.